Everything, barring the intensely turquoise waters of the Indian ocean, felt startlingly familiar. The sultry weather, the spicy coconut infused curries, the colorful attire, the ornately chiseled doors. Even the traditional game of Bao. My Indianness, and the fact that I had grown up watching monsoon winds billowing the lateen sails of Arab dhows and dreaming of following in the wake of mythical adventurers, diluted much of Zanzibar’s cliched otherness for me. And yet my fascination wasn’t diminished. For the labyrinthine alleyways of Stone Town, the historic urban centre of Zanzibar island or Unguja, evoke a history of cultural confluence like no other. A common, cosmopolitan identity forged over centuries by the melding of indigenous tribes with early Arab settlers, Persian Shirazis, Portuguese conquerors, Omani sultans, Indian traders and British colonialists. Along with a number of European explorers lured by the wealth of the archipelago and the mystique of the dark continent. The name, redolent of hype and romance, is believed to be derived from the Persian Zanj – a corruption of Zinj – for ‘Black’ (people) and Bar for Coast. The religion is largely Muslim. Unlike Mangalore or Goa, where Portuguese surnames are common, colonial influence on culture, speech and attire appears minimal. The imprint of the Indian merchant community however, is hard to miss. Especially in Zanzibari cuisine. 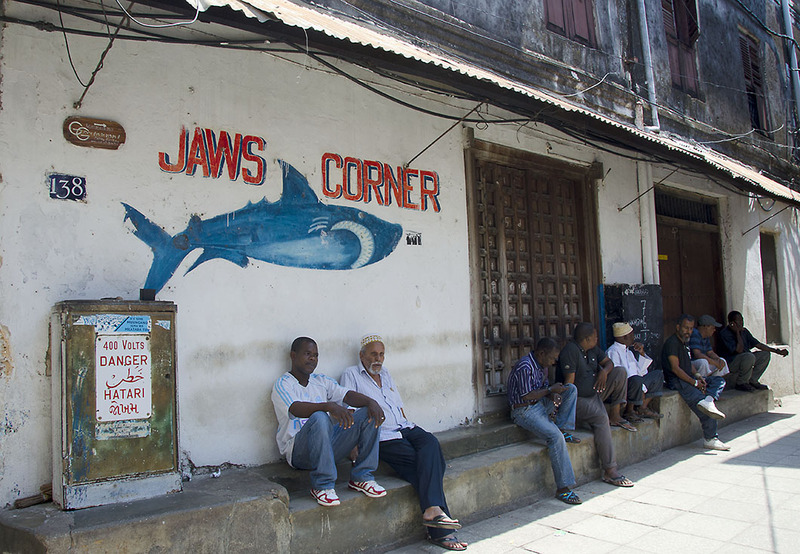 Jaws Corner – The local ‘hang out’ spot. Most people come for the languid, pearl white beaches of the many islands that make up the archipelago. 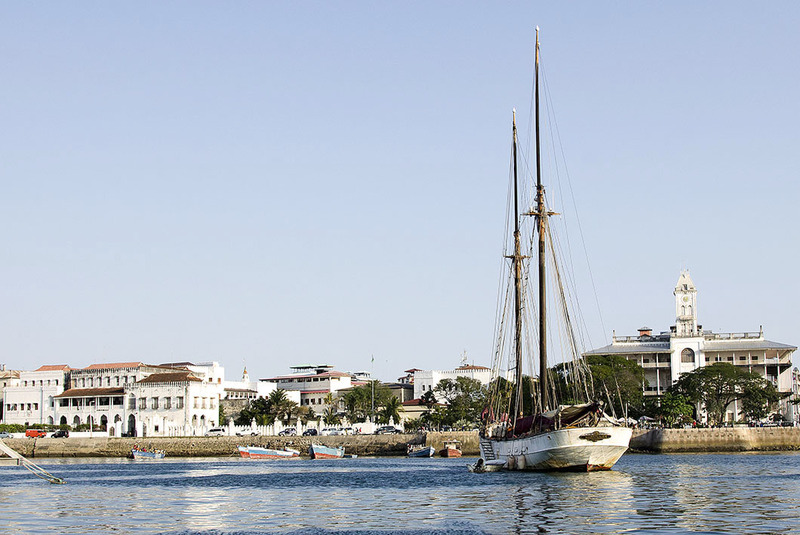 With just three nights on hand at the end of our long safari, we opted to spend all our time in Stone Town. Apart from one blissful afternoon at the Rock. Our frustratingly inefficient receptionist at the Kisiwa House somehow teamed us with a surprisingly capable guide for a three hour walk around town. Abdul filled us in on the nuances of local culture while deftly walking us through the narrow souk like alleys and bustling markets teeming with life and produce and people. All familiar versions of the grander bazaars of Cairo or Istanbul. Post independent socialist leanings aside, Zanzibar clearly lives off its former opulence and the sustained appeal of its decaying palaces and mansions. The exquisite coral rag structures with ornate wooden balconies hark back to a time when the city was the hub of Indian ocean maritime trade in spices, gold, ivory, animal skins and yes, human beings. The nicest have been fashioned into hotels. The Anglican Cathedral Christ Church marks the site of one of the largest open slave markets in this part of the world. The most elaborate edifices in town line the waterfront recently restored by the Aga Khan Trust for Culture. They are best viewed from across the water on a dhow ride. Preferably at sunset. Chief among them is the Beit el Ajaib also kown as the House of Wonders, the first building in Zanzibar to have electricity, and also the first building in East Africa to sport an elevator. The Beit el Sahel or Sultan’s Palace next door is now a museum evoking the opulent lifestyles of the sultans. One room is dedicated to the memory and romantic legend of Princess Sayyida Selme, an Arab/ Zanzibari princess who eloped with her German neighbour. The ornate facade of the Old Dispensary down the road, disappointingly conceals tacky shops. While the Old Custom House nearby, houses the Dhow Countries Music Academy, where we attended a lovely amateur Taraab performance. The Beit el Sahel (Sultan’s Palace) and the Beit el Ajaib (House of Wonders) from our dhow. The Forodhani gardens right on the seafront, once the landing point for the Sultans, transforms each evening into a lively food market. We were wary of the grilled meats, but returned two evenings in a row for delicious ‘Zanzibari Pizza’ (essentially a stuffed paratha with a wonderful assortment of sweet and savoury fillings) and Babu’s spiced tea! A map we picked up from a bookshop near our hotel on our last evening, set us off on a photo hunt of Stone Town’s old carved doors.. One of the doors graced the Capital Art Studio founded by Ranchod Ojha, the sultan’s royal photographer, and now owned by one of his sons. We hiked up to the temple later that night through hushed, dark alleys, accompanied by the lilting muezzin calls of “God is Great”, hoping to capture a colourful and noisy Indian festival in full swing. But with festivities showing no signs of taking off until well after nine, and an early flight to catch the next morning, we returned disappointed. Still, who could have imagined we would be paying obeisance to Durga on the ‘tenth day of victory‘ in a Hindu temple in distant Zanzibar? Thank you for another great post! I really didn’t know much about Zanzibar, and appreciated your including the history, as well as a beautiful series of photos that capture the local flavor and colors. Now I have to go follow some of the links that have caught my curiosity! You always strike a perfect balance! There is something magical when I think of Zanzibar ~ I name I have read about in history, and a place teeming with life. Over the past week, I’ve bumped into stories, posts and photos of Zanzibar and it is becoming more real and your writing (and great photos) and it all brings this place more to the forefront for me in the sense that “hey, I really can go their and experience it…” I like your description of the “opulence and the sustained appeal of its decaying palaces and mansions” I think that would be fascinating to see. Well done Madhu, wish you safe travels! Thank you very much Randall. I hope you get there soon….it would be an absolute delight to revisit Zanzibar through your lens! A dream I hope to realize 🙂 Take care Madhu! We loved Zanzibar…I would love to go back. Us too. For all its decay it had a wonderful, laid back vibe. I would have loved to have had a few more days to relax on one of the beaches. Oh you make me want to go there! There isn’t an awful lot to see inside that fort sadly. They do hold concerts there during the annual music festival which must be very atmospheric. Very interesting … yet the paragraph below the market image provided a lot of sadness to me. Thanks for sharing your journey. A visit to the dungeons where they were held was far worse Frank. I plan to feature it in a separate post. Zanzibar’s dark history, and the horrific massacre of Arabs and Indians during the 1964 revolution is usually glossed over by most travelogues. Madhu, so good to see you. I really enjoyed the trip around Zanzibar with you, a place that seems so exotic to me. Thanks! Janet, tried to comment on your blog but it seems to vanish into thin air. Would you check if it has been marked as spam and restore it please? Facing this issue with many blogs!! Have contacted support but they are flummoxed as well. I’ll check, Madhu. WP issues are such a pain! Thank you Madhu,what an interesting place – I enjoyed learning of the history and your beautiful photographs of the surroundings. I had heard so many stories about this place but never had a chance to see it. I doubt whether I could have a better tour! 🙂 Happy March, my dear Madhu! Thank you for your lovely comment 🙂 Happy March to you too! Your last sentence lingers and is full of irony. You were on familiar ground, Madhu and yet so far from home. You bring back so many memories of our two days in Stone Town and believe me, we weren’t in a familiar culture. We dined in a Muslim home one night and ate in an Indian restaurant the next. I can still taste the memorable dishes. I do wish we took a sunset ride on a dhow. I would have liked to have seen Zanzibar from the water. Lovely post. Zanzibar, a vivid description of their daily life, their culture, the market…nice snapshot to add up to your lovely narration. Historical significance and the connection of Indians…the place appears tempting to make a visit. Yes, Zanzibar is well worth a visit. Thank you Nihar. 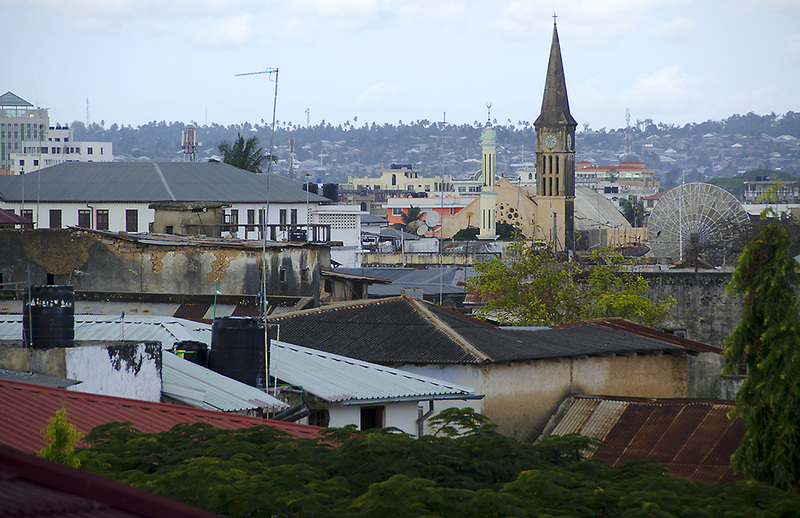 We’ve been toying with the idea of visiting Zanzibar for a few years, but never made it there. I found your post really fascinating and informative. Looking at your photos, the one of the slave sculpture really captured my attention. What terrible times they must have been. I can’t believe you haven’t been there Sylvia! Then again, I am yet to visit Sri Lanka, which is just across the straits from us 🙂 You would love the beaches especially. Lovely post and photos. Brings back great memories of my visit to Zanzibar in November. That picture of slavery reminds us that even in today’s so called enlightened world millions are still in positions of slavery. That food looks really yummy! You are so right. Ban or no ban, human trafficking is till a huge issue in many parts of the world. Wonderful post, Madhu. Loved it. Beautiful pictures. I especially enjoyed Jaws corner. Jaws corner reminded me of the little squares and street corners where local men gathered in many small towns in Greece! Must be quite common in the middle East as well. Appreciate your stopping by Shimon. Have a great day! This is a post that makes me dream, Madhu! I had no idea of the strong Indian influence in Zanzibar – it is amazing how globalisation took place centuries before we even came up with a term for it. I have not even heard of the place .. beautiful pic’s.. Thank you for introducing such a lovely palce .. I am surprised you haven’t Bikram. Every explorer worth his salt has been there at some point or the other. Including, it is believed, Sindbad! 🙂 Thank YOU for reading. Lucky you! I would have loved to have had a few more days to relax on one of those stunning beaches 🙂 Glad this stirred fond memories Shelley. Thank you for stopping by to share your thoughts. My favorite picture = Jaws Corner. I generally shy away from taking pictures of people (I think Hungary has passed a law forbidding it), but it’s beautiful when people are ‘captured’ living their day to day life. I did too, but am more comfortable shooting people these days. Hadn’t heard of that Hungarian law… I better be careful when I do get there 🙂 Thank you for your visit and comment Jen. Have a great day! Gosh thats so so beautiful! Another fascinating account of a place that has only been an exotic name for me. As always you weave information beautifully with your own experiences. And I was amused by ‘stereotype alert’! Thanks you. Stereotypes are rather hard to avoid in a country as diverse as ours 🙂 Thank YOU Meg for reading and for your thoughtful comment. Always a pleasure to see you here. The name Zanzibar conjures up images of the orient and the mystique that surrounds it. Your post didn’t disappoint Madhu and I was taken on a mystical journey with your images and descriptions. You’ve done it again, Madhu! Beautiful post – writing and photos. When I saw the title Zanzibar, immediately I thought of spices 🙂 Thanks for sharing, it helped me to go on a mythical journey which I hope one day I actually get there! Imagine that… celebrating Vijayadashmi in Zanzibar! Sometimes, more than the “otherness”, it is the discovery of old connections, that I find so alluring about travel. So true. That invitation was most unexpected, and we were disappointed we couldn’t stay. They were just warming up by the time we left past nine! Madhu, as you said in one of my earlier posts that Indians and Chinese were already on the moon long before Armstrong set foot there, and Zanzibar must have been one of the places the Indians went before they eyed the moon. 🙂 Now you got me thinking, had the Indians not come to the Indonesian archipelago in the 4th century, we wouldn’t have had Borobudur, Prambanan, and all those dishes we’re now so familiar with. Thanks for taking us to see Zanzibar with this perspective, Madhu. Ha, I would think so, considering Zanzibar is just across the seas from us 🙂 I can’t wait to explore the familiar in Indonesia……..the connections there seem deeper somehow. Thanks Bama. Yes, Zanzibar was the capital of the Omani Sultanate for a while. I hope you manage to get there someday Cathy. Pleasure to see you. Are you back home? Busy with some repair work needing attention around the house and dealing with infuriating workmen who don’t turn up when they are supposed to! Aarrgghh!! We are in the throes of decorating (or rather, Mick is 🙂 ). Poor house hasn’t had a lick of paint since the Dark Ages. You have my sympathy. Just saying the word “Zanzibar” conjures the exotic, the mysterious. If we return to Africa, Zanzibar will again be on the itinerary for sure. Your great post has reconfirmed that. It will be on ours too. Thanks Ron. I can always be transported to a wondrous place via your wonderful photography, Madhu. Thanks for sharing Zanzibar. Thank you for reading Ruth! Have a great weekend. Its always so wonderful to see all these beautiful pictures from place I have never visited. A great post. And every great post deserves a great hook in the title, and a great first paragraph, which you have provided here. Ah, thank you for the lovely compliment Tom! Much appreciated. Just the name ‘Zanzibar’ conjures up so many extoic images in my head that I wonder if I went there, I might be disappointed that it didn’t match up to my ridiculously over the top expectations. In reality, I’m sure I’d find it fascinating. It certainly sounds it from your post and lovely photos. Hope I get there one day. I was supposed to spend New Years Eve of 2000 on Zanzibar. Didn’t work out. Been thinking about getting there ever since. Hasn’t worked out. Yet. Your blog is good stuff. Your photos are too. I hope it will the next time around! 🙂 Thank you very much for your lovely comment. I’ve never used the word “bucket list” but I do understand the concept. Phew … I am amazed at all of the wonderful things you’ve shown us. Stellar post, Madhu. But, I wouldn’t expect anything less. Isadora, you are too kind..always! 🙂 Thank you very much. Jaws corner? JAWS CORNER? I swear, bud, one of these days, you are going to wake as me and I as you. And oh boy, I will run like hell. Love the charmed life you have leading, and that you are documenting it. Jaws corner! Sorry, that just sounded so amazing. Your words came to life with the matching, beautifully captured, images on the slideshow. Well done, as always. Awesome post. Once this Place was popular among Finnish travelers!